6000hp for me, 16-645s Turbo EMDs Don’t compare to the HP you guys are talking , But when your in the ER standing between them hooked up , They sound like 2 jet engines., They always took us home. thats big boy horsepower. I like the sound of the exhaust too. Yeah ,for sure! I liked it when I would be tanking on fuel at Fort Mifflin in Philly and the Crowley tug (don’t rem the name atm) going buy with the container barge that went to Puerto Rico. Hearing them a mile away ,then when they went buy those 20-645s w/turbo would shake the water. If they where 645s ,could of been 710s ,Someone should know that on here. The commuter trains around home for me all used to have 16-646 e3’s and there was nothing sweeter to hear them go full rack pulling out of the station behind my old apartment and catch a whiff of exhaust if the wind was just right. Other engines just aren’t as satisfying. Just under 12,000 HP Twin Screw. [QUOTE=Tugs;185255]I assumed (I hate that word) that they were compound boxes. I have worked on some pretty big boats but some of those AHTS are a sight to behold. 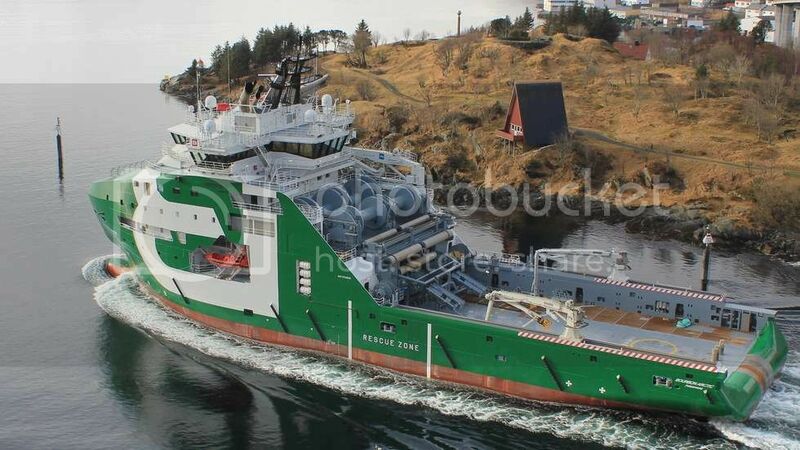 She will be working for Lundin, assisting the MODU Leiv Erikson as the one and only Anchor Handler while drilling in the Barents Sea to the north of North Cape. Jeeze I feel inadequate with my measly 3k in kitty cats downstairs!